It's the gifs which made me fall in love with Opus Magnum. Without them it's reliably good Zach Barth fare—an alchemy-themed option from his assembly line programming puzzle oeuvre where you move different reagents around a board in order to create compounds. 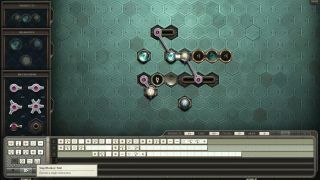 With them it's a puzzle game which has the capacity to take hours of concentrated, messy tinkering and present it back to you as an elegant, perfectly looping mechanical process. Here's how it works. The actual puzzle-solving element of Opus Magnum tasks you with creating a particular compound as a finished product. Compounds look like 2D molecules. For example, face powder is one hex tile of Elemental Earth joined by an alchemical bond to an adjoining hex tile of Neutral Salt. Getting the Elemental Earth is quite easy because it's the basic reagent the level starts you off with. Just pick that up using one of the mechanical grabber arms and move it around. Getting the Neutral Salt requires you to use a grabber arm to pick up a bit of Elemental Earth and pass it over a hex tile called a Glyph of Calcification. Once you've done that you need to drop both the Salt and the Earth in the two adjoining empty hexes which make up a tile called the Glyph of Bonding. This fuses the bits together to create the face powder. After that you pick up the face powder and move it to the product section. The product section is a tile in the exact shape of the compound you're creating. It acts as a guide so you can see how the elements need to connect, but is also part of the puzzle as your alchemical products are only counted if they are placed exactly on the product tiles. So going from one tile which spits out Elemental Earth to a bonded pair in a collection slot via one transmutation is a bit of a palaver. My solution used piston arms, a Glyph of Bonding, one of Calcification and a whole heap of retractions, rotations, grabs and releases. I lost track of the minutes as I repositioned tiles, or ran the programming instructions to check for errors. I frequently mistook the rotation command for the pivot command. If you do that, the element an arm is holding uses the end of the arm as a pivot point, instead of rotating around the tile the arm extends from. I forgot to use the reset command at the end of a line and wondered why it wasn't periodically repeating properly. If the game packaged up footage of all the steps I'd taken on my way to a solution it would have been a horrific mess. If you watched it you would think less of me, not only as an alchemist, but as a human being. It would be a Logic Game Crime. What the game actually does is run the program long enough to collect a number of products, and thus presumably check that you have not botched a solution which just about holds together for a single run. It then takes one loop of this solution and gives you the option to record it as a gif. The advantage of these gifs to Zachtronics is obvious—they form a wonderfully shareable showcase of the game, tapping into the same hypnotic appeal as the real life machinery footage over on the mechanical gifs subreddit. But the value for the player is more unexpected. Sure, it acts as a trophy; a way of showing off an odd or cool contraption to your friends. But it also performs another function. With programming puzzle games like this, you can bash your head against them for hours on end, making tiny changes, fixing problems and revamping entire segments. While you work on them they can feel messy, frustrating, unwieldy. Then you finish and you get the gif. It separates the period of strife from the solution. I've used the word ‘elegant' to describe these gifs a few times and I think it helps convey how they look in this isolated state when you've tried to refine the systems and have accomplished the objective. These gifs wash away the stress and frustration of the puzzle and convert the solution into something enjoyable in its own right. The kind of puzzle-solving Zachtronics games offer stresses me out. But here the gifs act as a counterweight. They soothe and they celebrate, minimising the memory of frustration and replacing it with triumph.